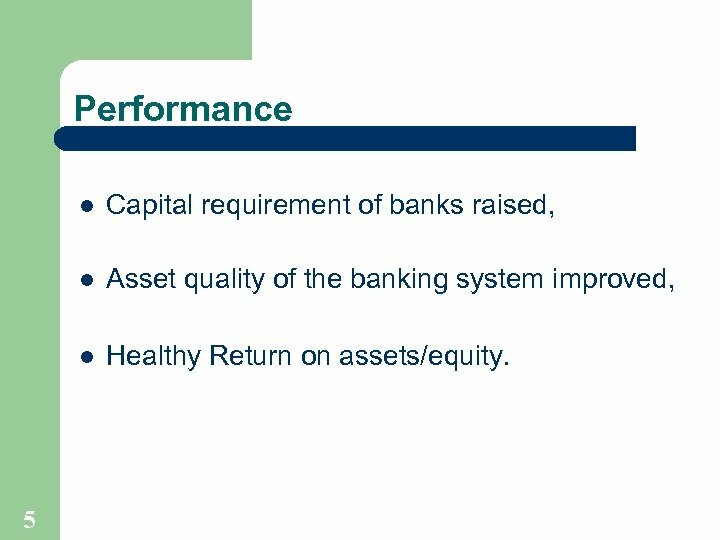 Performance l Capital requirement of banks raised, l Asset quality of the banking system improved, l 5 Healthy Return on assets/equity. 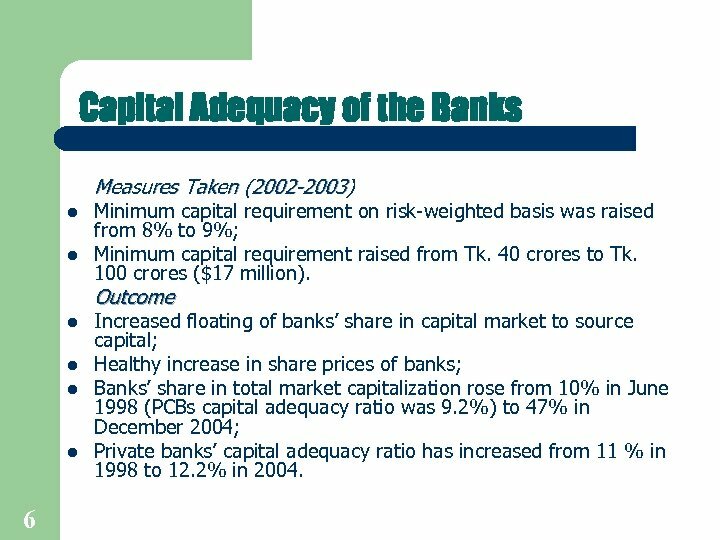 Capital Adequacy of the Banks Measures Taken (2002 -2003) l l Minimum capital requirement on risk-weighted basis was raised from 8% to 9%; Minimum capital requirement raised from Tk. 40 crores to Tk. 100 crores ($17 million). 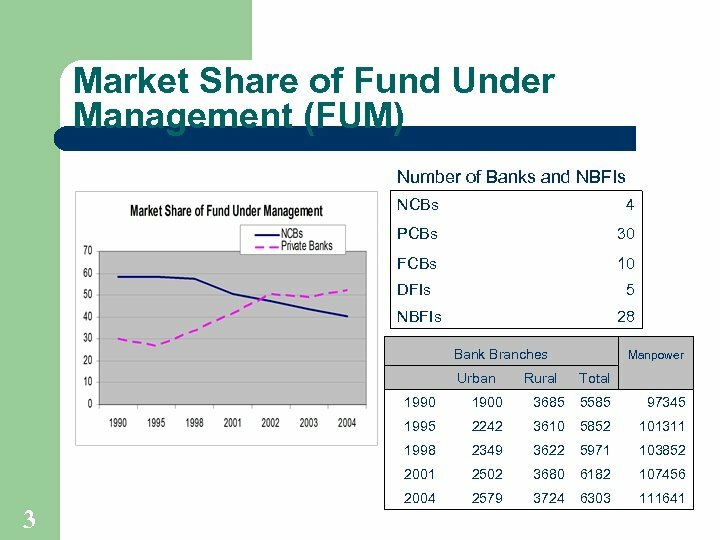 Outcome l l 6 Increased floating of banks’ share in capital market to source capital; Healthy increase in share prices of banks; Banks’ share in total market capitalization rose from 10% in June 1998 (PCBs capital adequacy ratio was 9. 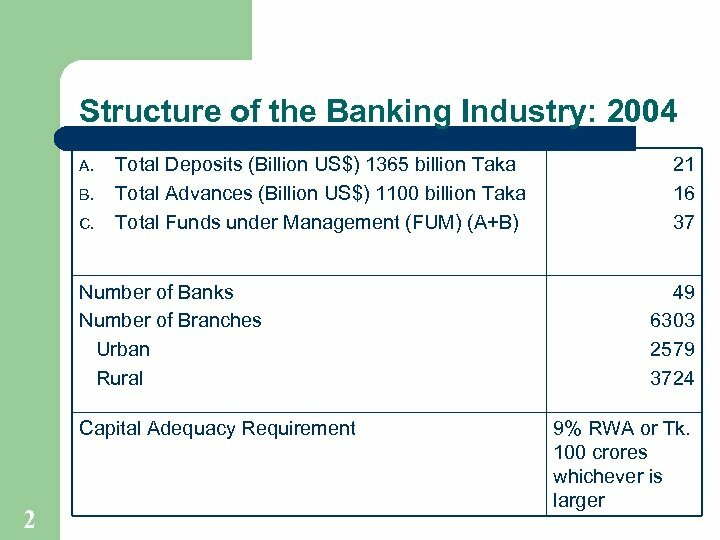 2%) to 47% in December 2004; Private banks’ capital adequacy ratio has increased from 11 % in 1998 to 12. 2% in 2004. 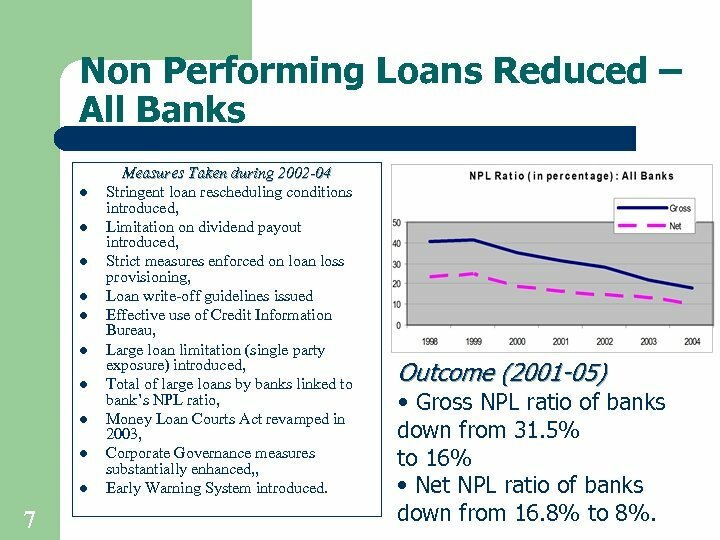 Non Performing Loans Reduced – All Banks l l l l l 7 Measures Taken during 2002 -04 Stringent loan rescheduling conditions introduced, Limitation on dividend payout introduced, Strict measures enforced on loan loss provisioning, Loan write-off guidelines issued Effective use of Credit Information Bureau, Large loan limitation (single party exposure) introduced, Total of large loans by banks linked to bank’s NPL ratio, Money Loan Courts Act revamped in 2003, Corporate Governance measures substantially enhanced, , Early Warning System introduced. 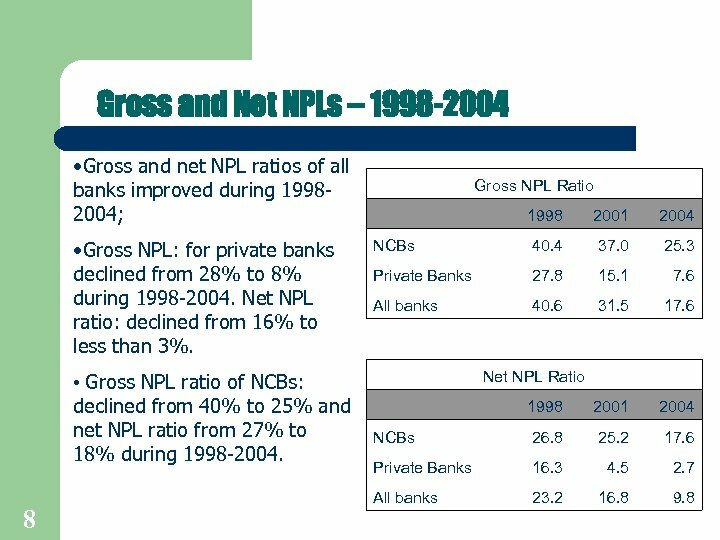 Outcome (2001 -05) • Gross NPL ratio of banks down from 31. 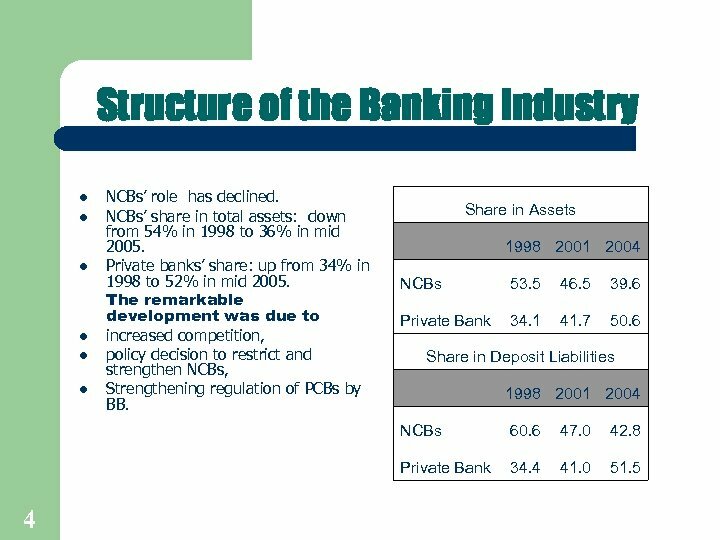 5% to 16% • Net NPL ratio of banks down from 16. 8% to 8%. 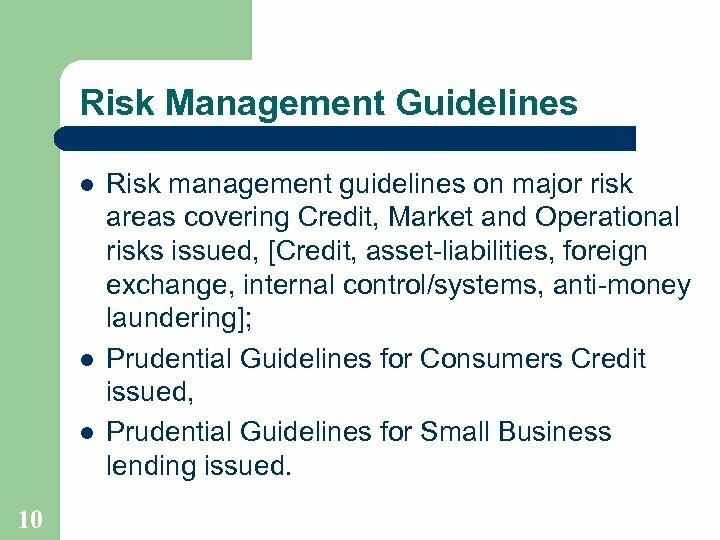 Risk Management Guidelines l l l 10 Risk management guidelines on major risk areas covering Credit, Market and Operational risks issued, [Credit, asset-liabilities, foreign exchange, internal control/systems, anti-money laundering]; Prudential Guidelines for Consumers Credit issued, Prudential Guidelines for Small Business lending issued. Supervision and Enforcement Measures 1. 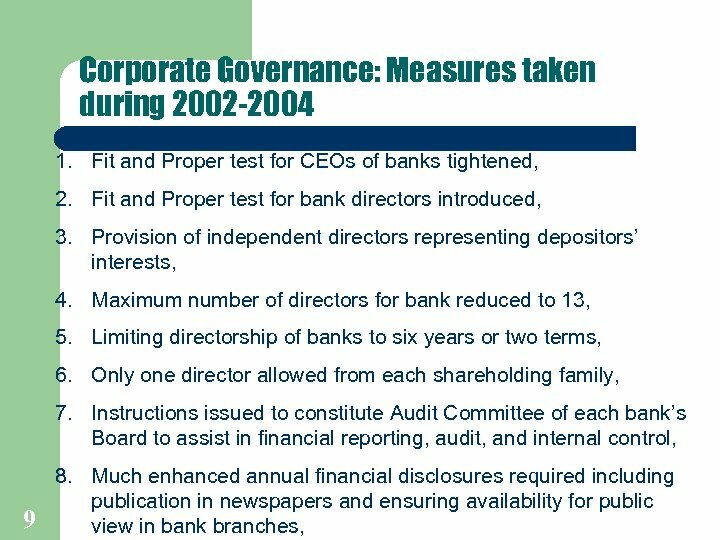 Five Managing Directors (CEOs) of banks removed since 2000; 2. A number of banks/bank officers fined for violation of regulations, 3. 65 Bank directors and Chairmen lost their directorships for loan default, insider lending practices and other violations. 4. Guidelines on Early Warning System and Problem Bank introduced, 5. Systems Audit with a risk rating [calculation of standard of a system (viz. 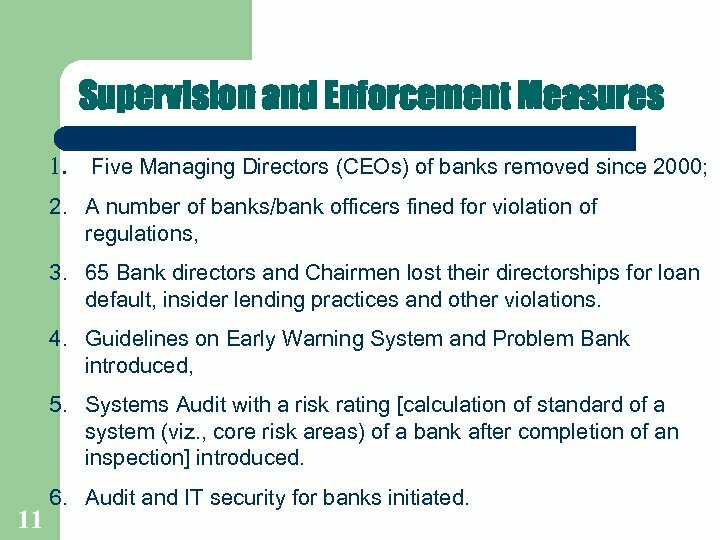 , core risk areas) of a bank after completion of an inspection] introduced. 11 6. Audit and IT security for banks initiated. 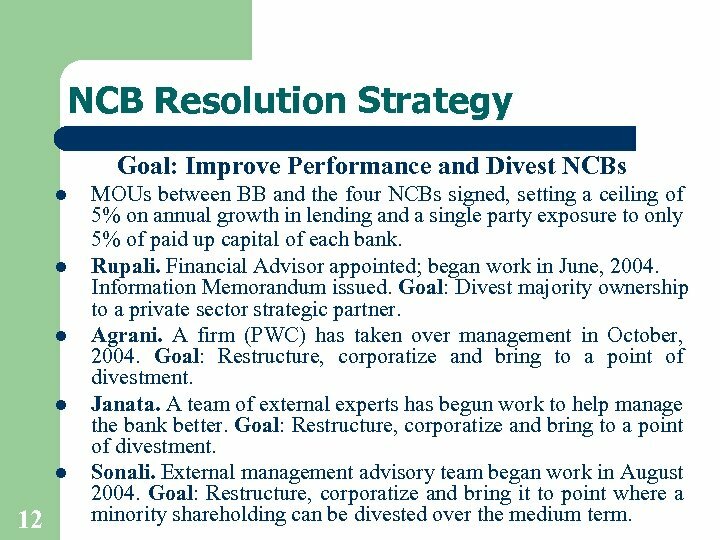 NCB Resolution Strategy Goal: Improve Performance and Divest NCBs l l l 12 MOUs between BB and the four NCBs signed, setting a ceiling of 5% on annual growth in lending and a single party exposure to only 5% of paid up capital of each bank. Rupali. Financial Advisor appointed; began work in June, 2004. Information Memorandum issued. Goal: Divest majority ownership to a private sector strategic partner. Agrani. A firm (PWC) has taken over management in October, 2004. Goal: Restructure, corporatize and bring to a point of divestment. Janata. A team of external experts has begun work to help manage the bank better. Goal: Restructure, corporatize and bring to a point of divestment. Sonali. External management advisory team began work in August 2004. Goal: Restructure, corporatize and bring it to point where a minority shareholding can be divested over the medium term. 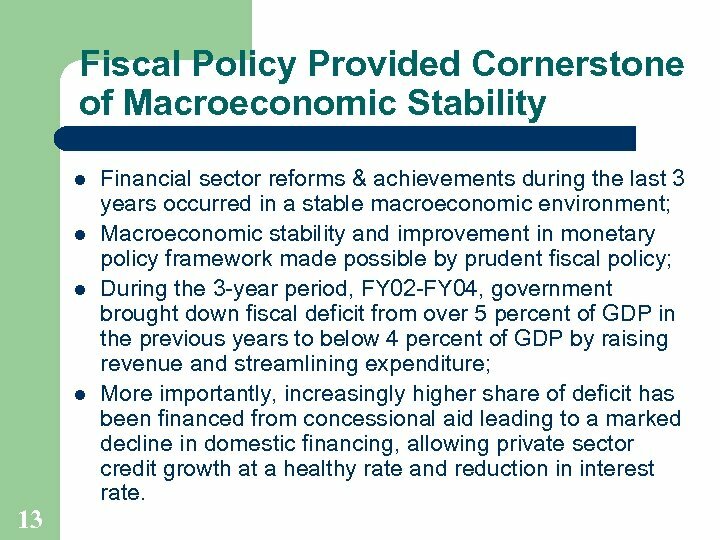 Fiscal Policy Provided Cornerstone of Macroeconomic Stability l l 13 Financial sector reforms & achievements during the last 3 years occurred in a stable macroeconomic environment; Macroeconomic stability and improvement in monetary policy framework made possible by prudent fiscal policy; During the 3 -year period, FY 02 -FY 04, government brought down fiscal deficit from over 5 percent of GDP in the previous years to below 4 percent of GDP by raising revenue and streamlining expenditure; More importantly, increasingly higher share of deficit has been financed from concessional aid leading to a marked decline in domestic financing, allowing private sector credit growth at a healthy rate and reduction in interest rate. 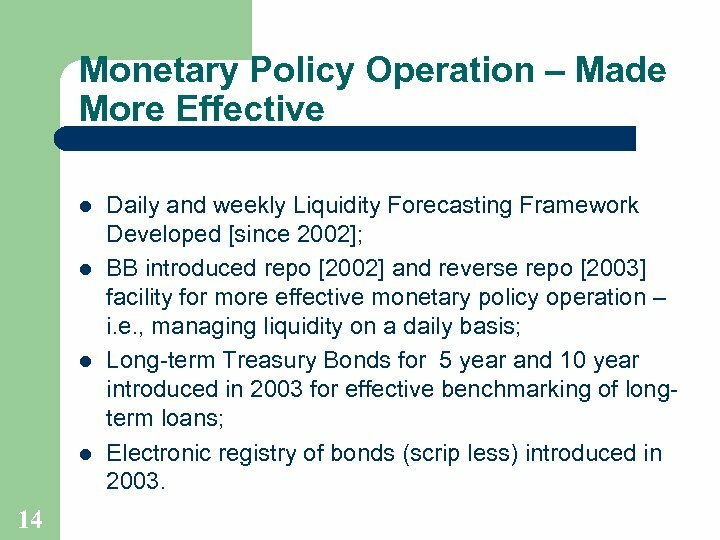 Monetary Policy Operation – Made More Effective l l 14 Daily and weekly Liquidity Forecasting Framework Developed [since 2002]; BB introduced repo  and reverse repo  facility for more effective monetary policy operation – i. e. , managing liquidity on a daily basis; Long-term Treasury Bonds for 5 year and 10 year introduced in 2003 for effective benchmarking of longterm loans; Electronic registry of bonds (scrip less) introduced in 2003. 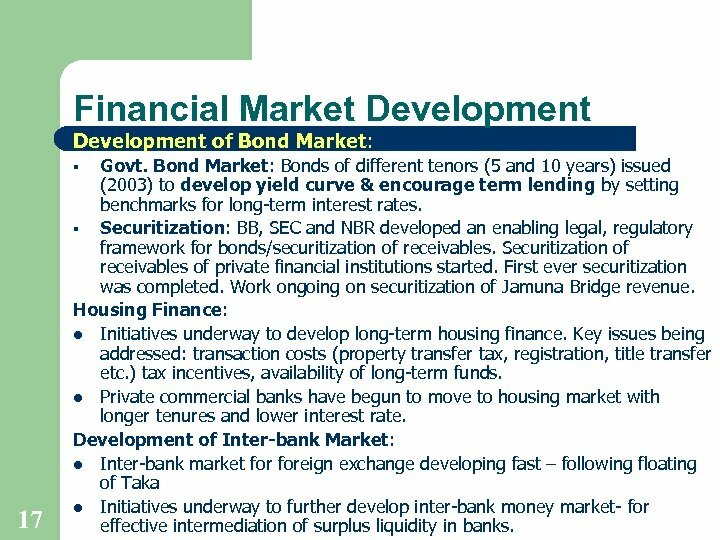 Interest Rate Development FACTS • • Recent Measures • Macro stability achieved; strict limit on govt. borrowing from bank; • BB introduced repo and reverse repo for Nominal lending rates remained at more effective monetary operation; high levels until recently. 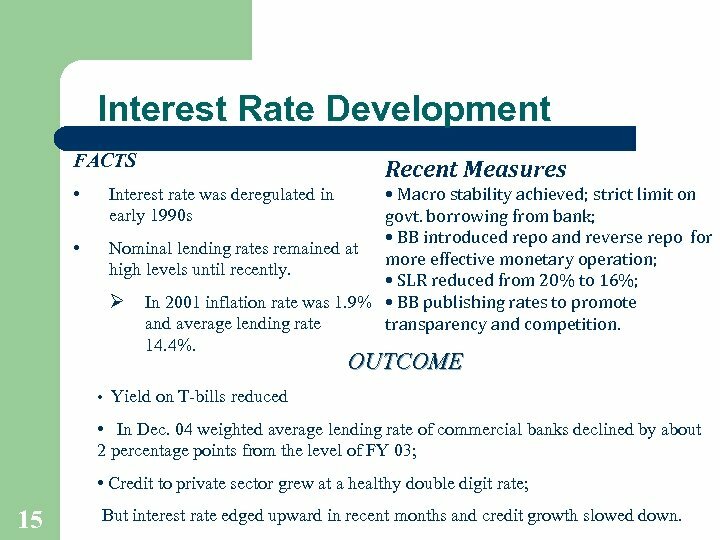 • SLR reduced from 20% to 16%; Ø In 2001 inflation rate was 1. 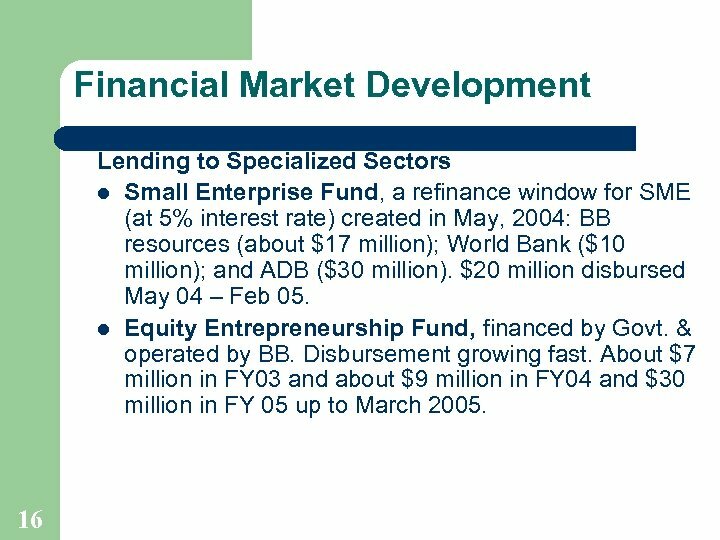 9% • BB publishing rates to promote and average lending rate transparency and competition. 14. 4%. Interest rate was deregulated in early 1990 s OUTCOME • Yield on T-bills reduced • In Dec. 04 weighted average lending rate of commercial banks declined by about 2 percentage points from the level of FY 03; • Credit to private sector grew at a healthy double digit rate; 15 But interest rate edged upward in recent months and credit growth slowed down. 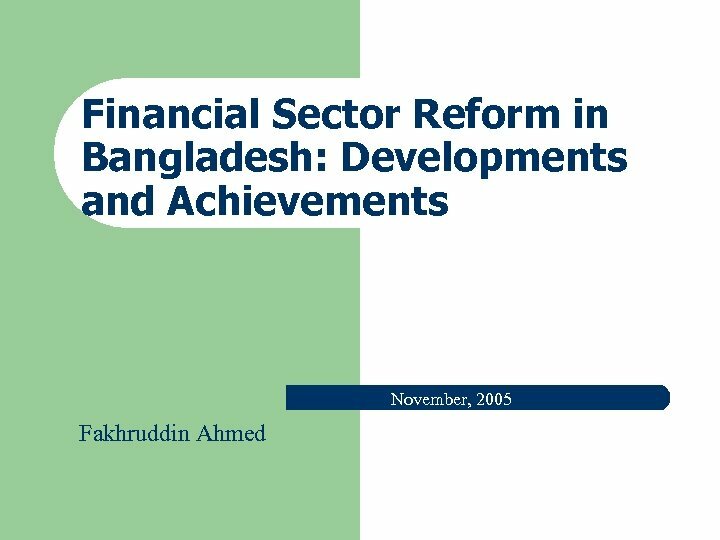 Strengthening of the BB Components of Bangladesh Bank Strengthening Program: 1. computerization of operations of BB, 2. human resource development through reforms of recruitment, promotion and compensation policies, 3. Direct recruitment taking place every year for the past three years, 4. Promotion policy being radically changed to emphasize merit, 5. restructuring the different departments, 6. reengineering the business processes, 7. capacity building in the core activities 8. With enhanced capacity has come better enforcement of laws and regulations, 9. Within Research Department, Policy and Analysis Group set up through open advertisement. Agreement with World Bank Institute signed. 18 The goal is to transform the decades-old traditional and manual system to a modern, automated system. 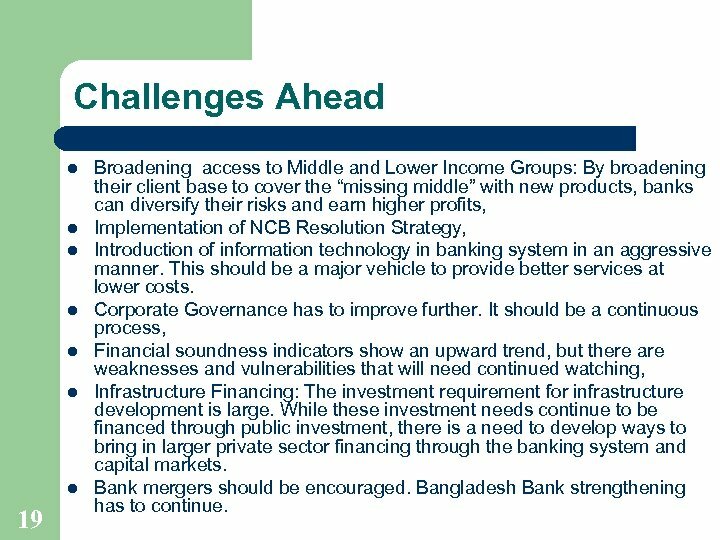 Challenges Ahead l l l l 19 Broadening access to Middle and Lower Income Groups: By broadening their client base to cover the “missing middle” with new products, banks can diversify their risks and earn higher profits, Implementation of NCB Resolution Strategy, Introduction of information technology in banking system in an aggressive manner. This should be a major vehicle to provide better services at lower costs. Corporate Governance has to improve further. It should be a continuous process, Financial soundness indicators show an upward trend, but there are weaknesses and vulnerabilities that will need continued watching, Infrastructure Financing: The investment requirement for infrastructure development is large. While these investment needs continue to be financed through public investment, there is a need to develop ways to bring in larger private sector financing through the banking system and capital markets. Bank mergers should be encouraged. 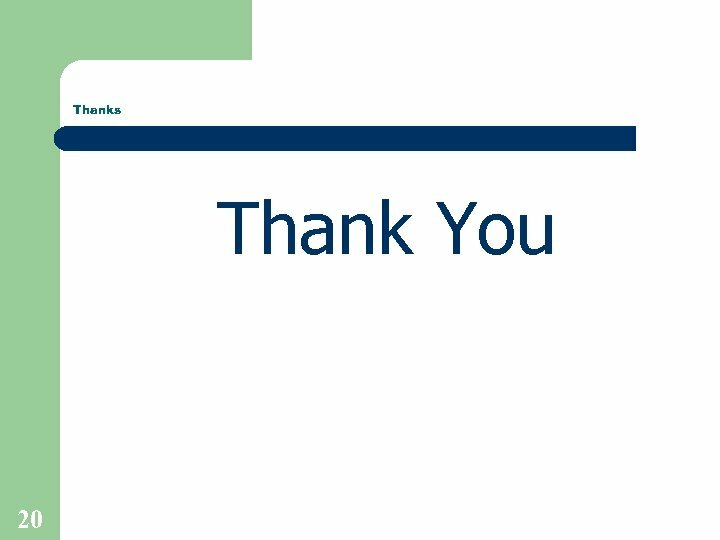 Bangladesh Bank strengthening has to continue.